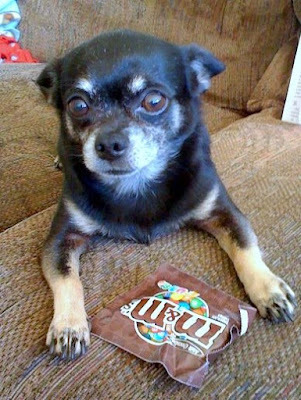 This is my Chihuahua, Rico, guarding M&M's. He is a NUT! He loves chocolate! No I don't give him any, well, I don't give him much. I know, I know, really bad for him, but man he goes crazy when he smells chocolate. He seems to like things that start with CH like chicken, cheese, chai tea and chocolate. Do you think that has anything to do with Chihuahua staring with CH?? awwwwwww bless little Rico ! if i had those treats id be guarding them too !